Here’s a goalie named Mason that Emma and I like. Mase played bantam hockey in his hometown of Oakville till he was drafted by the OHL’s London Knights in 2004. After one more year in the midget leagues, he moved to juniors and played 12 games with them. That was enough to impress the Columbus Blue Jackets, who picked him in the third round of the 2006 draft. He didn’t make his rookie debut that fall because the Jackets sent him back to the Knights when they deemed him a healthy scratch for their first two games, and then the Knights traded him to the Kitchener Rangers in January 2008 while he was with Team Canada at the World Junior Championships. He went to the Rangers with a gold medal and promptly injured his knee, and his attempt to play through it resulted in him having surgery. He missed the Rangers getting to the playoffs and winning the OHL Championship. A hockey hug from R.J. Umberger. Just when he was ready to make his pro debut, he had another knee surgery and missed his first month with the Jacket’s AHL team, the Syracuse Crunch. 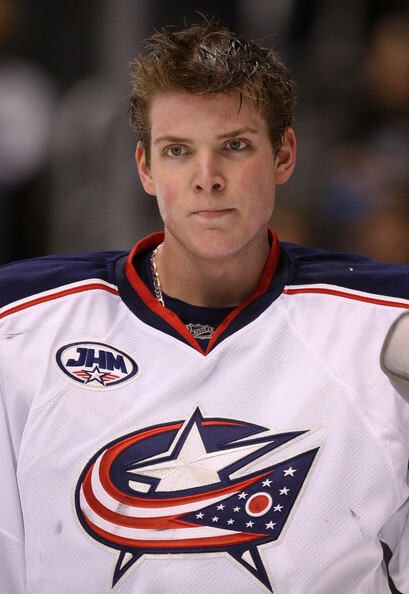 After he recovered and started playing in Syracuse he was called to Columbus and made his NHL debut on November 5, 2008 to replace Pascal Leclaire. The Jackets beat the Oilers that night, and R.J. Umberger gave him the winning puck. About two weeks later, he recorded his first shutout against the Atlanta Thrashers and kept starting in net even when Leclaire returned to the team. He was named Rookie of the Month for November and December, but when he was picked to play in the Youngstars game in 2009, he passed on it. Later, his coach told everyone why – Mase had spent the past month suffering from mono; they put him on Injured Reserve shortly after that (believe me, it takes a while to get over that). But he came back the day before Valentine’s Day and finished the season with a 2.29 GAA and a .916 save percentage. For that, he was nominated for the Vezina and won the Calder, beating out Kris Versteeg and Bobby Ryan. The past season saw him rack up a 3.03 GAA and a .901 save percentage, but with the additions of Jeff Carter and James Wisniewski, I think he’ll do better this season. I’ve seen Mase’s mask for this season, and I like it – it has a design on the left-hand side that’s an homage to the movie The Evil Dead. I have friends who are Bruce Campbell fans, so maybe Mase is one as well. I don’t want to like this team – seriously, I don’t – but he and Rick Nash are tag teaming my willpower. It’s gonna be hard not to watch him in action on Fox Sports Ohio this fall. Hi, you're pretty. Stop making me want to like the Jackets.